It turned so well that even Mr. VG was impressed and he's not an easy guy to please especially when it comes to Asian flavors. 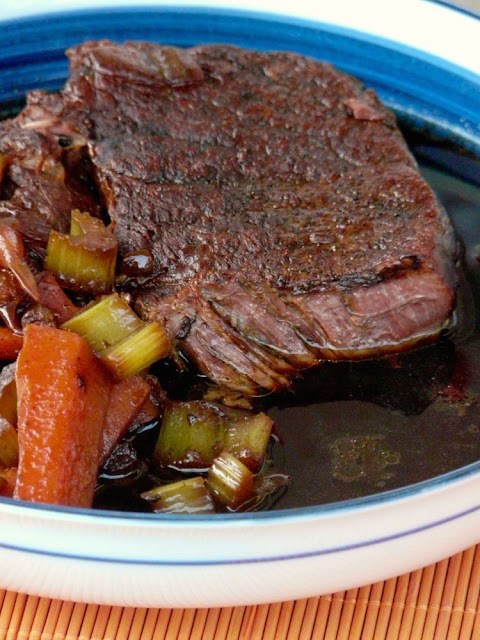 This pot roast has a bold, robust flavor and made for a hearty and comforting meal. I usually make pot roast in the slow cooker but it so happened that my crock pot was being soaked so it had to be cooked on the stove top. The meat still turned out super soft and tender. The key is to cook it on very low heat for a long time, 4 hours in my case but the end result is completely worth it. 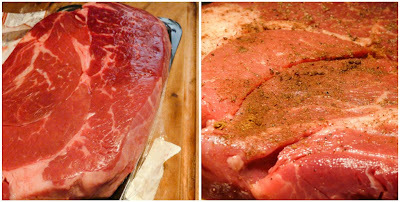 Pepper the piece of meat generously and then rub the five spice powder all over it. 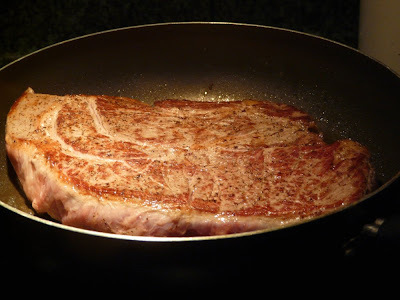 Heat the oil in a large frying pan over high heat and sear the meat well for about 5 minutes on each side. Don't move the meat once it is on the pan, except to flip it over. You want it to brown evenly. While the meat is browning, cut up the onions, slice up the ginger and smash the garlic. Add them to a dutch oven or heavy bottomed pot with a tight fitting lid. 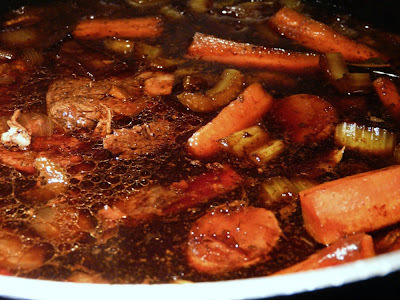 When the meat has browned, transfer the meat to the pot by laying it on top of the onion, garlic and ginger. Add the Worcestershire sauce, light and dark soy sauce and Chinese rice wine to the frying pan which was used to sear the meat. Stir well to combine and allow the liquid to deglaze the pan. Transfer the liquid to the dutch oven and add the bay leaf. Bring the liquid to a simmer then cover with a tight fitting lid. 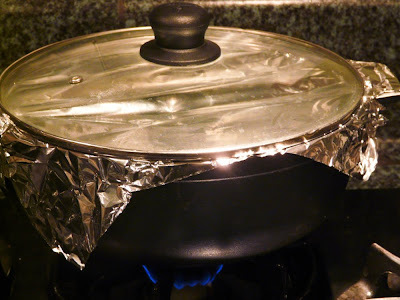 If you feel that your lid doesn't create a tight enough seal, first cover the pot with piece of aluminium before placing the lid over it. Reduce heat to the lowest setting possible. I moved the pot to my smallest burner but the heat was still a little too high. To combat this, I stacked one burner grate on top of the other so that the bottom of the pot could be raised a little higher and away from the direct heat. If you do this, make sure your grate can sit securely on top of another grate without wobbling. 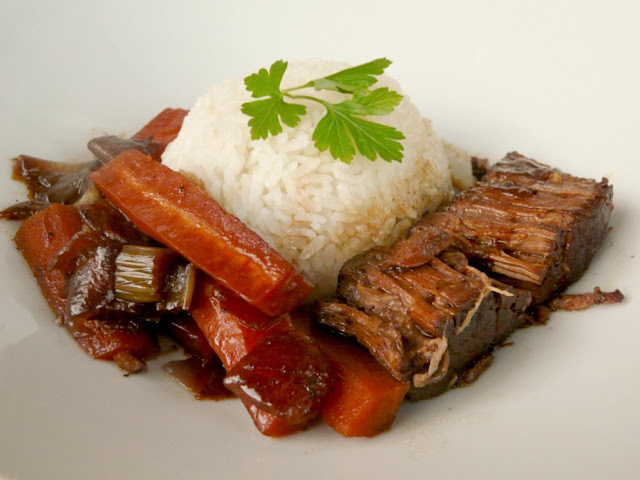 Cook the pot roast on the stove for 3 hours. You'll notice that alot of liquid will render from the meat over time. This is a good sign that the meat is being cooked properly and softening nicely. 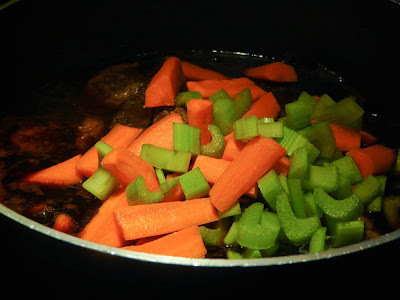 At the last hour of cooking, add the chopped celery and carrots to the pot. At this time, also add the brown sugar to balance out the flavor. After about 4 hours, the pot roast should be done. Add salt to taste before serving. You should get a lot of liquid in the pot which you can thicken with cornstarch or transfer to a small pot and simmer until reduced. 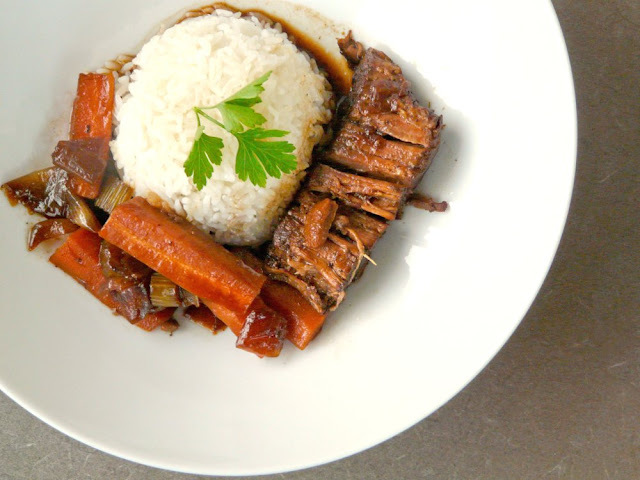 This is one pot roast that's better served with steamed rice. Now that is one tasty and balanced diet. The rice serving suggestion is agreed upon. I will try this with rice on the side.